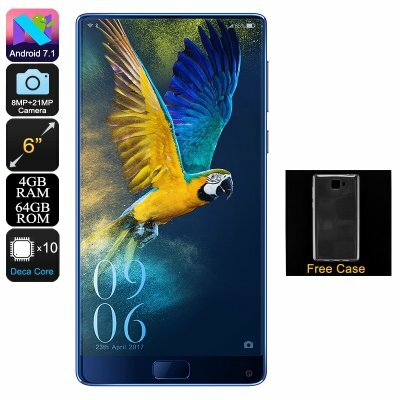 Successfully Added HK Warehouse Elephone S8 Android Phone - 2K Display, Deca-Core CPU, 4GB RAM, Android 7.1, 21MP Camera (Blue) to your Shopping Cart. The Elephone S8 smartphone is an outstanding Android phone that treats you to state of the art hardware and the latest software features. With its Android 7.1 operating system, this cheap smartphone lets you enjoy all the latest features the industry has to offer. The mobile phone furthermore comes with Dual-IMEI numbers and 4G support. This treats you to ultimate connectivity no matter where you’re at. Whether you’re at home, work, or traveling abroad – with the Elephone S8 smartphone you’ll always stay connected. With its stunning hardware, the Elephone S8 smartphone is definitely one of the best cheap Android phones currently available. The cell phone comes packed with the MediaTek Helio X25 processor. As a Deca-Core CPU that has been clocked at 2.5GHz, it brings forth a powerful yet energy-efficient performance. Along with the phone’s 4GB RAM, you’ll be able to tackle the most demanding Apps, games, and movies without dropping a frame. To make sure that you’ll always have enough memory for your files, the phone comes with 64GB internal memory. What else sets the Elephone S8 apart from other cheap smartphones is the fact that it comes with a stunning bezel-less 6-Inch display. With its 2K resolution, this screen offers breathtaking visuals for you to enjoy while watching videos or playing games. With its massive 4000mAh battery, the Android phone treats you to 20 hours of continuous usage time. This will easily get you through multiple days of regular smartphone usage. Additionally, the phone also features a 21MP camera that lets you shoot mesmerizing pictures and 4K video of all those upcoming special moments in life. The Elephone S8 smartphone comes with a 12 months warranty, brought to you by the leader in electronic devices as well as wholesale Android phones..